(Nov. 14, 2018) – For the past four years, USF St. Petersburg has celebrated International Education Month in November, using the opportunity to promote programs that prepare students for the global landscape, attract potential students and scholars from abroad and showcase international initiatives undertaken at the University. This year, USFSP is hosting two international scholars through one such initiative, the Fulbright Scholar Program. Fulbright seeks to boost mutual understanding between scholars in the United States and abroad. Hailing from Russia and Brazil respectively, Dr. Elena Plakhina and Dr. Emmanoel Vieira Da Silva Filho are using their time at USFSP to research their fields of study, connect with experts at the university, develop coursework and refine research methodologies. Dr. Elena Plakhina, Associate Professor of Journalism at the University of Tyumen in Russia. 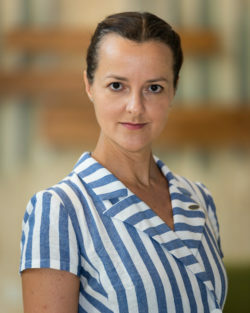 Dr. Elena Plakhina, Associate Professor of Journalism at the University of Tyumen in Russia, received her Fulbright Scholarship to study media design. Her goal is to create modernized and engaging coursework for her students in Russia. To that end, she has spent hours combing through books in the library and sat in on several journalism and digital communication courses. With an academic focus on design in the sphere of journalism, Dr. Plakhina looks at the various ways to communicate facts and stories to readers. Given Dr. Plakhina’s interest in visual design and production, her academic supervisor, Professor of Journalism Dr. Deni Elliot, said that USFSP was a good fit for both sides. “It’s good for our faculty and our department to be exposed to people who come at the work with different ideas. And we have a number of course offerings and faculty members who are comfortable in advanced digital design, so it seemed to be an opportunity for Elena to be exposed to some of the best in the business,” said Elliot. Dr. Plakhina has also taken the opportunity to help share aspects of her homeland with faculty and students. On Monday, November 5, she gave a presentation about the culture, science, history and natural beauty of her native Siberia. 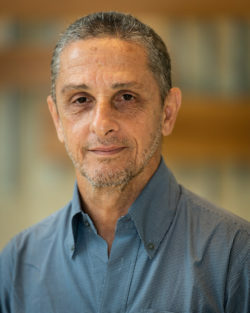 Dr. Emmanoel Vieira Da Silva Filho, Professor of Geochemistry at Fluminense Federal University in Brazil. USFSP’s other Fulbright Scholar is Dr. Emmanoel Vieira Da Silva Filho, Professor of Geochemistry at Fluminense Federal University in Brazil. Working with Biogeochemistry Professor Dr. Donny Smoak, he is researching better approaches to studying the carbon cycle in mangrove ecosystems, which play a significant role in carbon accumulation worldwide and aid in combating climate change by absorbing carbon dioxide from the atmosphere. During International Education Month, USFSP highlights its role as an inclusive community with an international reach. Each year, about 10-12 study abroad programs offer students the chance to take on educational opportunities abroad, whether immersing themselves in Spanish culture or honing leadership ethics in Greece. Around 85 students from USFSP participate in these programs each year, while another 15 travel internationally for internships or conferences. International Education Month at USFSP grew out of International Education Week, a joint initiative of the U.S. Department of State and the U.S. Department of Education. A full list of campus events around international education can be found at USFSP’s International Education Month website.